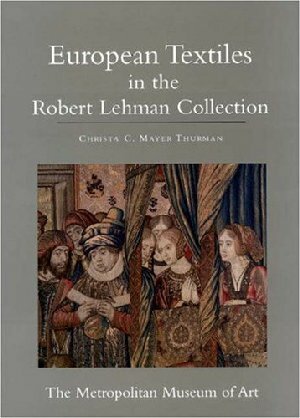 This volume, the tenth to be published in a projected series of sixteen, catalogues the European textiles and objects made of fabric in the Robert Lehman Collection at The Metropolitan Museum of Art. Robert Lehman and his father, Philip Lehman, purchased textiles with the same well-trained eyes they used to acquire paintings, drawings, and decorative arts in general. Among the most distinguished and widely admired objects in the Collection are two series of embroidered roundels from fifteenth-century Flanders and four large tapestries, including the Last Supper after Bernaert van Orley that is arguably the finest Renaissance tapestry in an American collection. The Collection also includes a great number of ecclesiastical vestments and panels of magnificent silks and velvets in a vast array of techniques and styles that span more than six centuries. Many of these textiles were used to decorate the Lehman town house in Manhattan, as hangings, covers, or upholstery. They represent sixty-five years of assembling, owning, and living with historical fabrics on a day-to-day basis, and for scholars and laymen alike they document an American style of living and interior decoration that has largely disappeared.